Donation after Brainstem Death (DBD) is possible from patients whose death has been confirmed using neurological criteria (also known as brain-stem death or brain death). Neurological criteria for the diagnosis and confirmation of death applies in circumstances where brain injury is suspected to have caused irreversible loss of the capacity for consciousness and irreversible loss of the capacity for respiration before terminal apnoea has resulted in hypoxic cardiac arrest and circulatory standstill. This diagnosis is only possible in patients who are on mechanical ventilation. 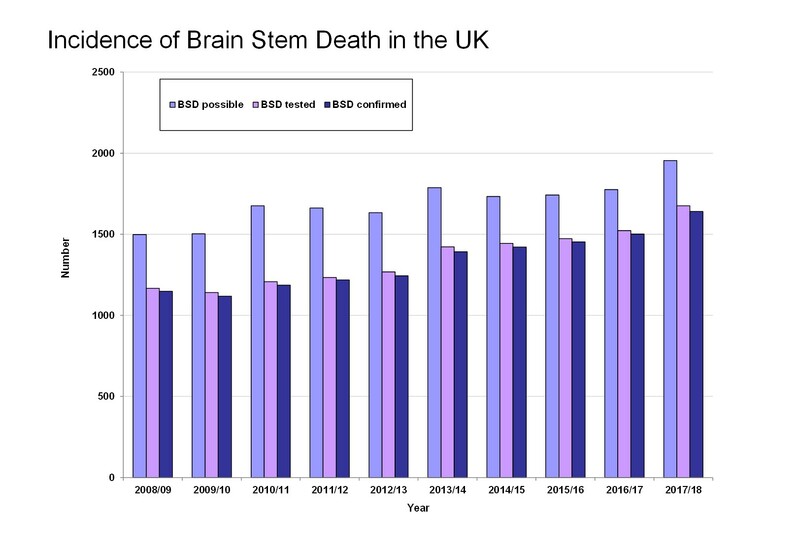 Below: Potential Donor Audit data from 2008 to 2018, indicating a consistent gap between patients who fulfil the preconditions for brain-stem death testing and those who are tested and whose death is confirmed using neurological criteria. The rise in numbers in 2010 is a result of extending the audit to Emergency Department.